Nothing makes me pile on mounds of rice on my plate like Chorizo de Bilbao. An intense, Spanish sausage, chorizo de bilbao is so robustly flavored that even a tiny bit goes a long, long way when paired with rice. My favorite is the canned kind where the chorizo comes packed in lard. Because it’s commercially made, I doubt its authenticity, but then, it doesn’t matter to me. What’s important is the rich, intense flavors and crackly, crisp skin that remind me of meals from my childhood. 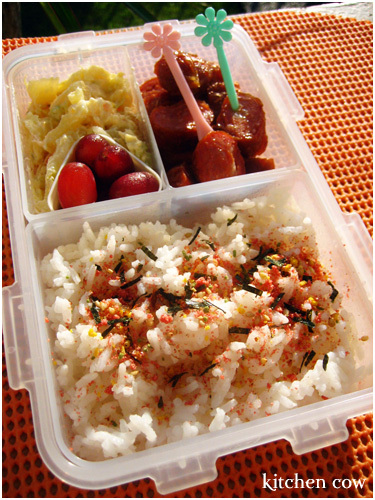 So how can a bento with chorizo in it fail to please, right? Rice and slices of chorizo, adorned with a small pick for easier eating. That in itself should be more than enough, but why stop there? For the veggie and fruit part, I added a small serving of homemade potato salad. Chockful of shredded chicken, carrots, pineapples and apples, this potato salad always spells comfort for me. The pineapple adds a refreshing sweetness while the apples lend a delightful crunch to the whole thing. To balance the whole thing, I added a few seedless grapes which were very sweet. To finish it off, I dusted a pack of furikake on the rice, adding interesting textures, colors and flavors to the otherwise plain rice. Hi, your bento looks delicious. Can I ask you where you got your lock and lock? what did you put on top of the rice?? is that chili powder or something?? Furikake 😀 It’s a kind of rice sprinkle made of all sorts of things. It can be as simple as toasted sesame seeds or pre-packaged flavored seasonings like this one. where can you get the sprinklie ones that are pre-packaged? I’ve been looking for them in supermarkets but haven’t had luck. Haven’t really ventured in other places. What supermarkets have you checked? Some supermarkets, like Makati Supermarket and Landmark have them, only they come in big packets like those Knorr Instant soup ones? If there are none, Japanese groceries would be your best bet. Also, you can try making your own. Just Bento has homemade furikake recipes. Indeed Chorizo De Bilbao are tasty. I think the one you’re referring to is Marca Del Rey Brand. They’re packed in lard inside a dark green can with gold letterings. During the old times (60’s,70’s,80’s) they were okay. It used to be made originally in Spain. Then a Chicago based food company started manufacturing this under this brand (Marca Del Rey). Recently I found out that CoNagra (a giant food company, based in Nebraska) bought out this Chicgo co. and started making these chorizos under the same brand Marca Del Ray. Now here’s the lowdown: CoNagra is notorious for irradiating and adding preservative chemicals in their food products to prolong their shelf-life. Bro, just go easy on these chorizos if you want to live longer. You don’t want those chemicals building-up in your body overtime. And who knows, you may start glowing in the dark in the future. Oh, I buy a local brand. Besides, I eat chorizo occasionally. I guess like most things, it’s best to take these things in moderation. As a kid, I used to ignore it when mixed into stuff like Paella but loved the plain chorizos. Now I eat them any which way. Though plain with rice still holds its place in my heart.